Algansee township was established in 1848, with the village of Algansee in the approximate center of the township. 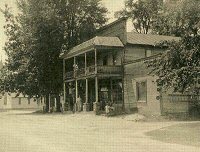 A general store in Algansee village known as Safford's Store (built in 1880) was chosen as the place to have the first library, and thanks to a Kellogg Foundation grant, the library opened in 1938, with Doris Williams (née Dove) as the first librarian. In 1963 the county had closed the library in favor of a bi-monthly bookmobile to the area. This idea proved to be a flop, however, and on February 11, 1964, the Branch County Library Board authorized the re-opening of the Algansee branch, at the same location as before. It has been open ever since, although it has been moved from one side of the store to the other, in order to have more space. 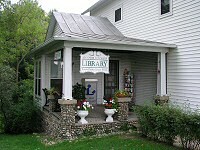 Although it is the smallest of the branches in the Branch District Library System, the Algansee Library plays a central role in the community and has seen its usage increase in the last few years. In addition to books and magazines, the library also offers videos, computers with Internet access, and programming for children and adults.